﻿ 5 Ways to Build Your Nonprofit Email Subscriber List » Red Mango Marketing! Gaining support for your organization via email marketing has become easier than ever. In fact, Dunham+Company found that the percentage of donors motivated to give online via email has jumped 40% since 2015. This is why it is important to build a quality email subscriber list. People subscribe to email lists if they know the content they receive will be worth their time. Think about how your nonprofit can create value for subscribers with each email newsletter you send. Is there a resource you could offer for free in exchange for their email address?. FamilyLife found that offering a free online course in addition to signing up for a newsletter increased conversion by 47.2%. Website pop-ups can be annoying. There are some pop-ups that show up as soon as you open a website and unless you close them, you can’t view any content in the background. But if used to your advantage, website pop-ups aren’t always frustrating. Most pop-ups are asking for information from the reader, but with the right timing and by focusing on your audience you can get them to an action. Make sure your pop-up has a clear call-to-action (CTA). Go beyond “Sign-Up Now” and “Subscribe”. Try something like, “Yes, I want to donate!” or “I’m interested in this cause” or something as simple as “I would like to learn more”. Just remember, opting-in shouldn’t make customers feel as if they are setting themselves up to receive dozens of irrelevant emails with hardly any relatable content. A landing page is a page on your website designed to convert visitors into subscribers or leads. Many landing page best practices suggest using large header images, inline quotations, and minimal copy so that visitors get to the signup form faster. This brought an astounding 448.65% increase in email signups. Contrary to popular belief, social media is a rather efficient way of getting donors involved in your nonprofit’s cause. Whether it’s Twitter, LinkedIn, Facebook, or Instagram, if there’s a social media channel available, someone is on it. Social media is dynamic and fresh. If you don’t have a vibrant social media presence, you may be missing out on some great opportunities to connect with your supporters and pick up more subscribers. That said, your nonprofit does not need to be on every social media site. Focus on one social platform at a time. If majority of your donors are on Twitter, stick to it. Interact with them, use appropriate hashtags, and work towards gaining user generated content. Ask your followers which causes they support and if they have any stories to share. Social media is most effective when you combine it with your existing email marketing strategy. Make it easy for your email subscribers to find you on social media by adding buttons to all your active social media channels in your email newsletter. You can also use Constant Contact’s Social Share feature to promote your emails on your social channels. Increasing the visibility of your newsletter is one of the best ways to build your email list. An easy but highly effective way to collect emails, especially if your nonprofit organizes drives and fundraising events frequently, is in person. Attendees/supporters/donors can opt-in and sign-up for your email list when they register. Having a physical email signup sheet at the event is another great way of giving attendees a chance to sign-up for your nonprofit’s emails. Some other great tools you can use to collect sign-ups are website sign-up forms, the Facebook Page app, text messages (Text-to-Join), and QR codes (Scan-to-Join). These tools can be used right from your Constant Contact account. If your nonprofit has supporters who send in their donations via cheque or snail mail, include a field where donors can opt-in to your email list on your form. Encourage your subscribers to share fundraising campaigns with their network thus increasing the exposure your nonprofit receives. Just because events happen “offline” doesn’t mean you can’t use them to create more opportunities for supporters to connect with you online. Growing an engaged email list for your nonprofit can be easy. By following these five tips, you can boost excitement around your nonprofit organization and use email to engage donors, volunteers, and overall awareness of your cause. 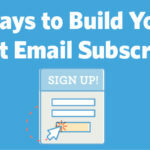 The post 5 Ways to Build Your Nonprofit Email Subscriber List appeared first on Constant Contact Blogs. This entry was posted on Friday, July 20th, 2018 at 8:00 am	and is filed under Email Marketing, List Growth, News & Updates, Nonprofit. You can follow any responses to this entry through the RSS 2.0 feed. Both comments and pings are currently closed.